Betty Davidson says the secret of a long life is happiness. One half of Scotland’s longest marriage has celebrated her 100th birthday. Betty Davidson marked the celebration of her century on Thursday with a visit to her husband of 77 years, David, in his Angus care home. Mother-of-two Mrs Davidson, from Dundee, is a sprightly centenarian who does not take any pills or medication, has never had any serious illnesses and still lives independently. Her and David are believed to have the longest marriage in the country after they tied the knot in 1934. 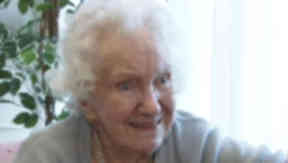 While celebrating her birthday with David, who is 96, at the South Grange Care Home in Monifieth, she told STV News about her secret to long life. Mrs Davidson said: "Just be happy, we've had a very happy life. I’ve been very, very lucky health-wise you know. No complaints, no serious illness, I never thought I would live to be 100 though. "I never gave that a thought. I don't feel older. I am a wee bit slower I think but that's about all. We've been very lucky. It's just unfortunate he has to be here. If I could have him home, I would have him home tomorrow but that's not possible." Her daughter Gloria Proctor added: "It's something you don't ever think that will happen in your lifetime, you'll know somebody who's 100 years old but when their your own family, it's quite incredible really. "And my dad, he's got four years to go before he'll be 100 so we'll hope we have him for another four years too. Everybody tells me I have the genes of my mother and father so perhaps I'll reach my 100th birthday."